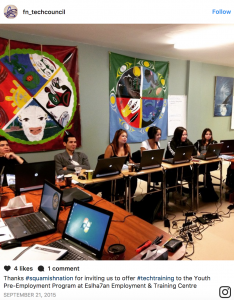 Decades of oppression and forced assimilation have led to the steep decline of Indigenous languages but there is new hope as tech-savvy young people are fighting to preserve their culture. For generations, Indigenous families used storytelling as their primary way to pass down knowledge and language as elders would speak to the children in their language and the kids would naturally pick it up but that began to change in the late 19th century once the Canadian government passed the Indian Act. This law enforced colonial authority over First Nations peoples, partially to force assimilation through policies that displaced Indigenous people and removed them from their communities. Most notoriously implemented through church-run residential schools that aimed to erase Indigenous children’s cultures and connections to family, these institutions enforced a language ban. If Indigenous children were caught speaking their own language, they would face corporal punishment. Forced assimilation largely contributed to Canada’s Indigenous language loss by barring people from continuing to pass down the language. Denise Williams, First Nations Technology Council executive director, is aware that Indigenous memories of colonialism are inhibitors to the First Nations embracing modern technology. She is taking steps to change this. As part of a 1982 Canadian constitution amendment that allowed the integration of Indigenous people’s right to self-government, it also allowed for the adoption of contemporary software and information systems. These tools imposed on communities, added on top of an already imposed government structure, became a sore point for many First Nations people and therefore, is now the mandate of Denise and her technology council members to change this. 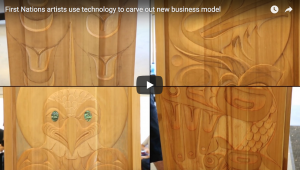 Even though the First Nations Technology Council faces resistance from some community members who view tech as a symbol of colonial oppression Denise and the council has spent four years visiting over one hundred Indigenous communities in B.C. carrying out mobile technological training programs to overcome this deep-seated resistance, her team providing everything from Microsoft Office certification to PC repair training. The enthusiastic feedback she received made her view tech as a key tool for Indigenous empowerment. On the council’s website, she notes that they have seen the profound effects of increased access to digital communication through movements like Idle No More and Stand With Standing Rock, which both achieved mass impact and galvanized activism. The council’s next mandate is to empower more Indigenous people to build communities and drive economic development online. Because of the work of this council, the future for technology has potential as Indigenous people gain the skills to partake in digital conversations while increasing reconciliation making a better world for all Canadians and Indigenous people. Based on my initial research it looks like Indigenous people use social media at a rate higher than non-Indigenous people, and this is the case right across the country. My research on social media, reveals that for most Indigenous people, social media is an everyday activity. 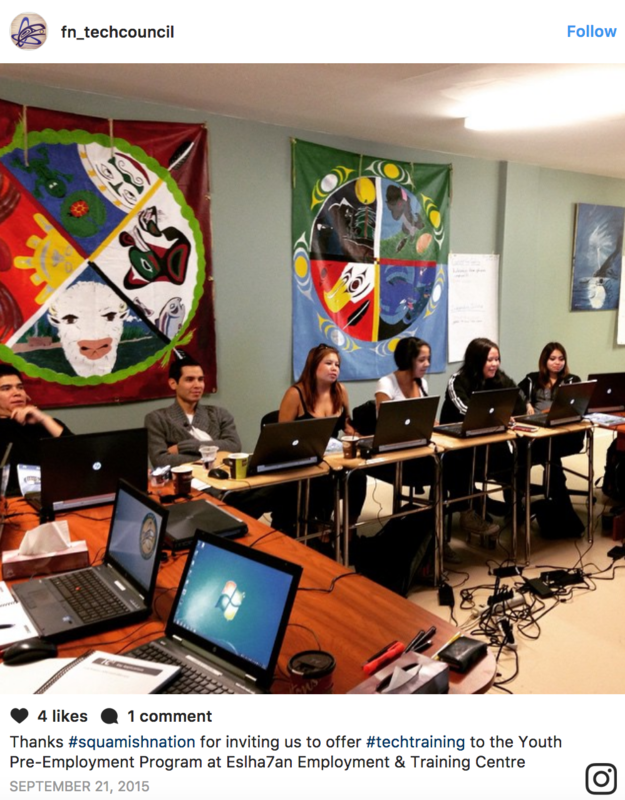 For some, social media provides a way to learn and express their Indigenous identity in a safe space. During my initial research, I’ve found some uniquely Indigenous activities on social media and while many non-Indigenous youths are dropping social media platforms like Facebook because their parents have profiles, Indigenous youth are actively engaging with older generations and maintaining intergenerational connections. In addition, my initial research is showing that older Indigenous are now reporting that social media provided them with cultural and family connectivity that they did not have before. Social media has in many ways bridged distances and is, as the founder of Electronic Frontier Foundation, John Barlow, suggests, a “world that is both everywhere and nowhere”. In this way, Indigenous populations worldwide are interacting online and supporting Indigenous issues and causes in a global collective. Given the similarities of experiences with colonization, Indigenous peoples can relate to, engage with and support each other on social media. However, research also confirms that the public can be traumatized by indirect exposure to certain events through social media. For anyone interested in learning more about Indigenous people and trauma on social media, I have found two interesting articles. The first is a chapter in IndigenousX anthology titled, “#Overwhelmed: Juggling the stress and positive potential of social media IRL”, and the second, titled “Trauma, Shared Recognition and Indigenous Resistance on Social media” issue of the Australasian Journal of Information Systems. Food for thought! Because of technology, we now have a new understanding of culture and communication. Indigenous peoples across the world have been affected by the introduction of technologies from foreign cultures for hundreds of years. Some have not dramatically changed their ways of life, while others have completely changed self-identities, entire societies, and worldviews. Modern technologies, especially telecommunication and computer technologies, allow indigenous groups to participate in the larger societies and economies around them. These technologies also enable them to preserve and promote their way of life for their descendants and for our collective knowledge of human history. Casey, James. “Native networking: Telecommunications and Information Technology in Indian Country.” Benton Foundation Online. Homepage online. Available from http://www.benton.org/Library/Native; Internet; Accessed 22 Sept 2017. Warschauer, Mark. 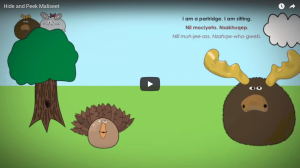 “Technology and Indigenous Language Revitalization: Analyzing the Experience of Hawaii”. Homepage online. Available from http://bit.ly/2htGVIP; Internet; Accessed 21 Sept 2017. U.S. Department of Commerce. “Native American Herbal Tea Company Finds Customers Using Latest Video Technology.” Access America Exporting 11. [e-journal] http://bit.ly/2xrNi69; Internet; Accessed 21 Sept 2017. The National Indian Law Library. “Native American Constitution and Law Digitization Project.” Home page online. Available from http://thorpe.ou.edu/; Internet; Accessed 21 Sept 2017. Native American Public Telecommunications. “Native American Public Telecommunications.” Home page online. Available from http://www.nativetelecom.org; Internet; Accessed 21 Sept 2017. Few would argue against the notion that the One Laptop Per Child project (OLPC, originally referred to by many as the ‘$100 laptop project’) has been the most high-profile educational technology initiative for developing countries and Indigenous cultures over the past half-decade or so. It has garnered more media attention, and incited more passions (pro and con), than any other program of its kind. What was ‘new’ when OLPC was announced back in 2005 has become part of mainstream discussions in many places today (although it is perhaps interesting to note that, to some extent, the media attention around the Khan Academy is crowding into the space in the popular consciousness that OLPC used to occupy), and debates around its model have animated policymakers, educators, academics, and the general public in way that perhaps no other educational technology initiative has ever done. The largest OLPC program to date, however, has not been in Uruguay, but rather in Peru, and many OLPC supporters have argued that the true test of the OLPC approach is perhaps best studied there, given its greater fealty to the underlying pedagogical philosophies at the heart of OLPC and its focus on rural, less advantaged communities. Close to a million laptops are meant to have been distributed there to students to date (902,000 is the commonly reported figure, although I am not sure if this includes the tens of thousands of laptops that were destroyed in the fire at a Ministry of Education warehouse). What do we know about the impact of this ambitious program?The Inter-American Development Bank (IDB) released a long-awaited working paper detailing findings from its evaluation of the OLPC program in Peru. While OLPC has been the subject of much research interest (some of decent quality, some decidedly less so; the OLPC wiki maintains a very useful list of this research), Technology and Child Development: Evidence from One Laptop per Child Program in Peru is meant to be the first large-scale evaluation of the program’s impact using randomized control trials (considered by many in the evaluation community as the ‘gold standard’ for this sort of thing). With reference to all the problems related to the Peruvian OLP project I feel it was two folded. On one hand, there was no previous training for teachers to develop methodological capacities to exploit the potential of those computers. Teachers basically taught the children how to operate the device, and that was it. On the other hand, it was one of many other big projects that had the aim to create noise in favor of President Garcia. 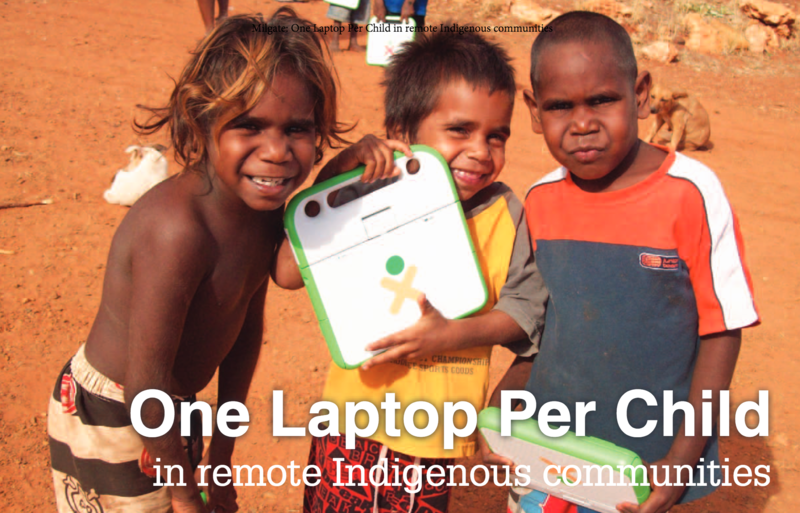 As part of my interest and research focus on the influence of technology on Indigenous culture and the issues that surround it and online sources that criticize the program from an Indigenous culture standpoint, I thought I would take this post to provide further information on OLPC. Founded in 2010, OLPC Canada (One Laptop Per Child Program) is a non-profit organization that works with corporate sponsors, service groups, individuals donors and Indigenous leadership to enhance education for Indigenous students by providing access to technology that is rich in educational and cultural content. As the videos describe, the idea behind the OLPC program is both ambitious and noble: to educate the world. But, can such a program be successful? Is the program just another way that Western ideals are being imposed on Indigenous cultures? Throughout the course of this semester, I hope to answer these questions.